Looking for a fresh pasta salad to entertain with this spring? 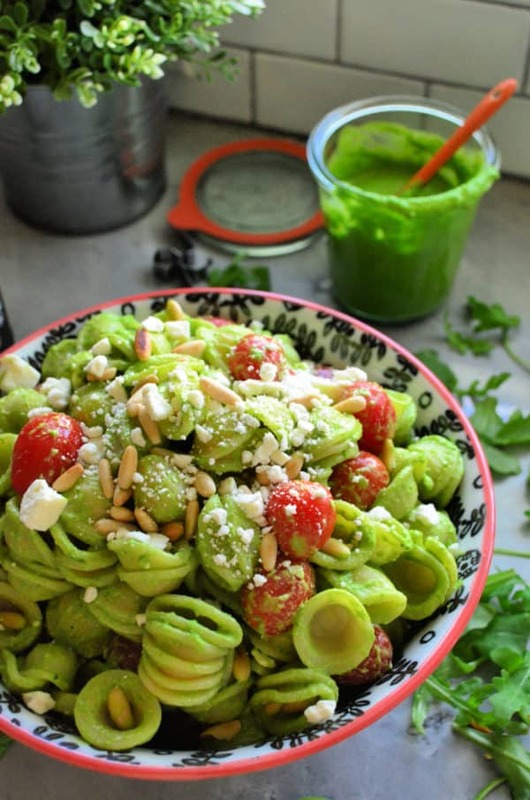 Try my easy recipe for Arugula Pesto Pasta Salad with Grape Tomatoes. I love an easy pasta salad recipe. Some pasta salad recipes require five hundred ingredients… others just require five ingredients. That’s the case for my Arugula Pesto Pasta Salad with Grape Tomatoes. I kept this pasta salad super simple. The other day I shared my recipe for arugula pesto. 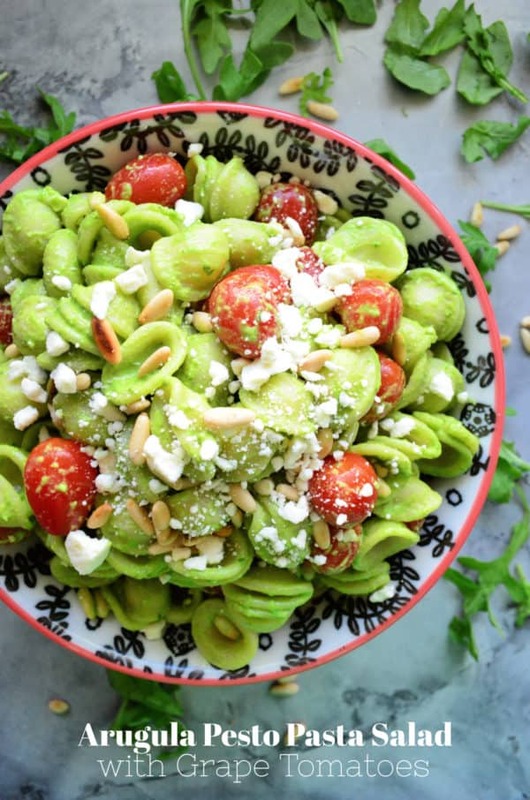 I instantly knew I wanted to make a delicious pasta salad with that pesto. But I also knew I wanted to keep it super simple. I really wanted the arugula pesto to be the star of the show, and thankfully didn’t go out of my way to purchase ingredients for this recipe. I used what I had on hand. To tone down that peppery arugula I paired it with salty feta cheese and fresh grape tomatoes. The toasted pine nuts (which are also in the pesto) give it a nice surprise crunch! What kind of pasta do you use for pasta salad? 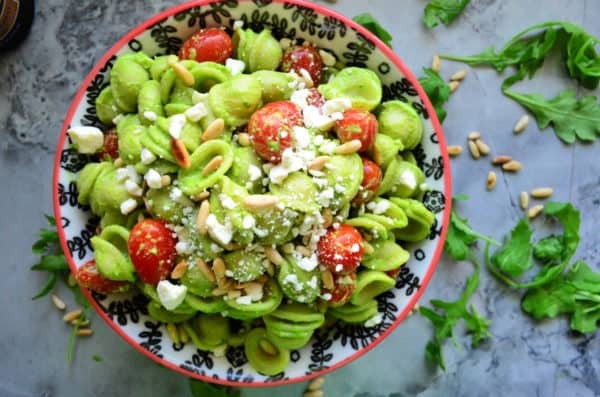 How do you make Arugula Pesto Pasta Salad with Grape Tomatoes? First, you will want to cook the pasta according to the package. Once the pasta is done drain the pasta, then rinse with cold water and set to the side. Place half of the fresh arugula pesto in a large container or bowl. Then pour in half the cooled pasta. Mix well, then repeat with the remaining pesto until all the pasta is coated. Add the grape tomatoes, toasted pine nuts, and feta cheese. Mix well. Chill in an airtight container in the refrigerator for at least 30 minutes before serving. This pasta salad will stay good in the refrigerator for up to 5 days. Although–if your like me and my family it won’t last one day in your home! You would never know if I didn’t tell you that this pasta salad contains Organic Flax Oil! 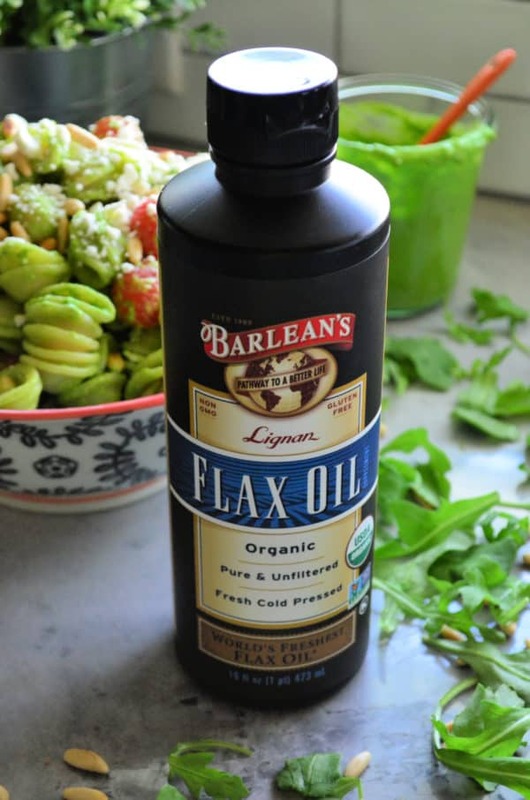 What is Organic Flax Oil you might be asking to yourself? Looking for more pasta salad recipes? Here are a few more of my favorite pasta salad recipes I’ve shared over the past few years. Cook the pasta according to the package. Drain, rinse with cold water and set to the side. Place half of the fresh arugula pesto in a large container or bowl. Then pour in half the cooled pasta. Mix well, then repeat with the remaining pesto. Add the grape tomatoes, pine nuts, and feta cheese. Mix well. Chill in an airtight container in the refrigerator for at least 30 minutes before serving.